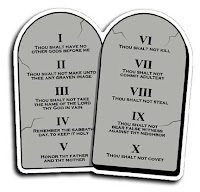 I am not an avid reader of the Bible, but I do believe that it offers some very good advice on some topics; and I try to follow the Ten Commandments, not necessarily because I think I have to but because they're good rules to follow. With that said, I'd like to offer up my Ten Commandments of Personal Finance, not that I have any illusions of grandeur, but because I think there are time-honored principles that we can follow to make our financial lives better and the analogy between the biblical commandments and the financial ones makes intuitive sense. You may recognize some of these. 1. Earning more than you spend is tantamount to any financial success you will have. You simply cannot build wealth and financial health unless you earn more than you spend. To get "into the black," you need to do one of three things: Spend less, earn more, or do both. If you make little income, there's only so far spending less will get you. You will simply have to find ways to earn more money, be it a job change, collecting cans, selling unused assets, or starting a side or hobby business. There are lots of ways to do this. My upcoming series on Learning to Earn will give you lots of ideas. 2. If you don't participate in your employer's retirement plan, you're leaving money on the table. Odds are, you work for a company that offers a 401k plan, or something similar if you work for the government or are a teachers. In most cases, your employer will match, to an extent, your contributions. Contribute enough to get the employer match. For example, if your employer matches the first 5 percent of your contribution on a one-for-one basis, meaning he matches your contribution dollar-for-dollar, then even with a flat or declining equity market, you will most likely make money. Think of it this way: Your employer is virtually guaranteeing you will make money in your 401k. I suggest that you only contribute whatever amount you need to in order to get the match. In the previous example, that would be 5 percent. Then invest the maximum amount in a Roth IRA. There is one simple reason for this: Most 401k plans have absolutely horrible investment choices. Ask your benefits administrator if there are other options. Many times, there aren't. Roth IRA accounts typically offer you much more investment flexibility. If only every 401k plan would offer a domestic index fund...then investing the max would be a no-brainer. 3. Set aside some money, preferably enough to sustain you for at least 6 months, in a rainy day fund. Make sure it's interest-bearing, but principal-protected, like a savings account. WaMu is currently offering 4 percent in their online savings accounts, if tied to their free checking accounts (full disclosure: I work for WaMu). There are many other choices, however: Credit unions, your local bank, and online bankers like ING and EmigrantDirect (I have account with all of these banks). Odds are, you'll find a job if you lose yours within 6 months. But it may not cover your expenses, so you'll need some funds available just in case. 4. Setting aside some money in a brokerage account, even if just a few dollars a month, will enable your investments to grow over time, and beginning early and contributing regularly (dollar cost averaging) will earn you more than you might imagine. Open an eTrade, Sharebuilder, or Scottrade account. All offer low commissions. Sharebuilder is unique in that you can set up an auto investment program where you pay $4 dollars per periodic investment. 5. With all you'll gain over time because you're following these Commandments, you'll want to protect your assets. The most important asset you have, though, is yourself. With that in mind, be absolutely sure to carry adequate life (term life, invest the rest) and disability insurance. Additionally, make sure you have enough auto insurance. Finally, if you have considerable assets, think about an umbrella policy. More on insurance in a future post. 6. Carrying a balance on a credit card is a bad idea, unless you're paying zero percent interest, in which case I say, "Take your bank to the bank!" Having a balance at 18 or 29 percent is a surefire way to spend more than you earn, which is, by definition, a personal finance sin. Pay off your balance and consider yourself as having earned 18 or 29 percent (whatever your current interest rate is) tax free. 7. Paying your bills on time, every time, guarantees that you won't be paying late charges or penalties on your credit card accounts. Doing so will also ensure that you won't be paying additional funds to turn services back on, like cable and water. Paying on time also is one of the keys in getting and maintaining a high credit score, which will save you tens of thousands of dollars in lower interest rates on mortgages, car loans, and personal loans. 8. Setting your finances on autopilot will make living these Ten Commandments super-easy. Read my previous posts on how to do this. 9. Setting aside some money for charity, whether it's through or because of your church or through the United Way or some other means, is good for the soul. It makes you feel better. It can also lower your taxes (it's never a good idea to spend money to save taxes, but if you're going to do it anyway, you might as well take the tax break). 10. Coveting your neighbors' stuff is not good. It only will sink you deeper into debt. "Keeping up with the Jones" will get you junk you don't need, like adult toys such as motorcycles, SUVs, boats, and other stuff that just takes up space and costs lots of money. Never pay more taxes than you're legally obligated to pay. This is to say, be honest, but seek out all tax credits and deductions available to you. Money you save in not paying undue taxes is FREE money. Take it.